Was this issue forwarded to you? Click here to join the IJA to get your own copy each month, and get full access to eJuggle too! Our annual festival is just one month away! Just a reminder that advance registration closes on June 30th. Don’t miss out on the chance to see the stage championships with: a record of over $35,000 total prize money on the line; the new and improved gauntlet obstacle course; free brunch all week; plus all the usual activities that make an IJA festival so great. The festival could never happen without lots of volunteer efforts. We are blessed to have numerous officials, event coordinators, workshop leaders and other volunteers that help contribute to bringing the festival to fruition each year. It’s always gratifying to see and experience the event for a full week after more than a year of planning. Of course, our festival would not exist without YOU — our members and festival attendees. Whether you are a hobbyist, a professional, a competitor, or a complete beginner, there is always something for you at an IJA festival. Regardless of what your style of manipulation is, it’s always great to come together, meet one another, learn, experience and celebrate what unites us. Full festival info, including online registration, is available at: www.juggle.org/festival. Don’t miss out on this opportunity to get the full week of epic shows and historic Championships prize money at an impressively low price. If you miss the online registration deadline, you’ll still be able to register at the fest. If you haven’t made your festival hotel reservations yet, do so now. Our three El Paso hotels are accepting IJA room reservations at IJA rates but those rates will soon expire. Go to the IJA festival website, move your mouse over Festival and click on Lodging to see all the details. Note that the IJA rates are only good through the dates listed below for each hotel. IJA rates may not be available after those dates. This hotel information grid has a summary of offerings at the three official IJA festival hotels in downtown El Paso. As we’ve provided in past years, we also have a Rideshares & Roomshares Forum on our website if you want to seek out people to share with there. You need to be a logged-in IJA member to post in the forum. The same team who brought you Gauntlet 1 and Gauntlet 2 are hard at work designing and planning a whole new set of obstacles to test your juggling agility and nimbleness. But to do it up right, they could use your help. To join the Gauntlet 3 crowdfunding campaign, go to www.juggle.org/gauntlet. Unna Med has graciously agreed to match your contributions dollar-for-dollar. Want to help with this year’s festival? There are many volunteer opportunities at the fest. Send an email to volunteers2016@juggle.org to find out more. The annual IJA election for members of the Board of Directors takes place at the IJA Festival in El Paso on July 27, 2016. 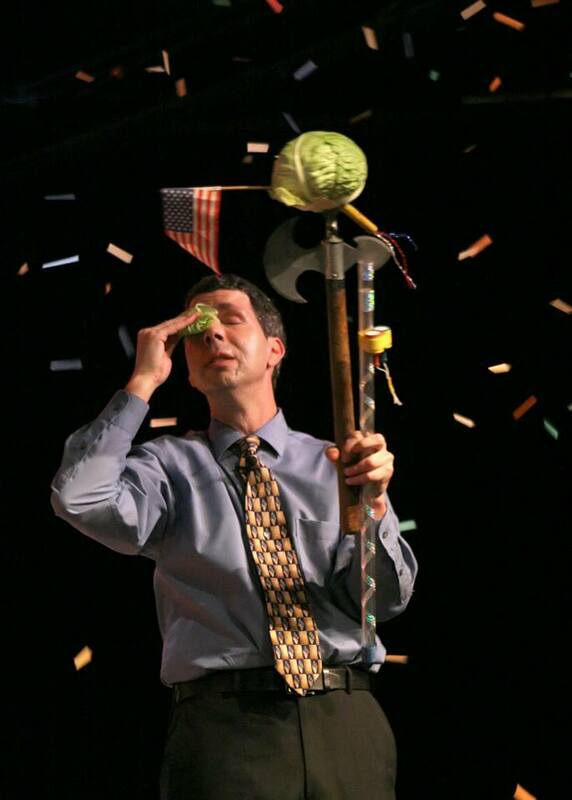 You can vote at the fest or you can vote online before the fest and save your festival time for juggling. The IJA Board of Directors is comprised of seven people who make policy and collectively decide on the direction of the IJA. Each director is elected for a two-year term. There are four director positions up for election this year, so IJA members can vote for up to four people in this election. The nominees and their statements are listed below. All regular, life, youth, and family IJA members who are at least 13 years of age as of July 27, 2016, can vote. (2) ON-SITE at the IJA Festival in El Paso, Texas, on Wednesday, July 27, 2016. Online voting is easy and only takes a minute or two. Or if you’ll be at the IJA Festival, you can vote there in person on July 27, 2016. To vote ONLINE before the festival, first Sign In at: http://ym.juggle.org. Here are the nominees for member of the IJA Board of Directors. Their statements follow below. I am excited for this opportunity to assist the IJA! I have great experience organizing, promoting, and running festivals. I would love to help the IJA expand it’s reach. I feel we can increase festival attendance by reaching out to more local communities. Every since I won the photo contest for IJA67 I have wanted to get more involved. I am creative, hard working, and dedicated. Since 2011, I have helped flowfests.com expand from South Florida to across the nation. I’d love to lend my skills to the IJA in whatever way I can. Thank you. My name is Louie Skaradek, I have been nominated for my second term on the Board of Directors. Over the last two years I have rendered assistance to my community of fellow jugglers by tackling projects from ‘Officer Write Ups’ to ‘Website Development’ and have been a regular at our two monthly meetings where we have voted on policy, overseen the budget and discussed the future goals and projects of the IJA. As a member of the IJA Board of Directors, I would like to be part of the team as we finish the website development project – which is looking really sharp and functional. I would like to help with increasing our membership and continue the development of our current YJA, IRC and World Juggling Day projects. I’ve had the honor of serving two terms on the IJA Board of Directors and have spent the last two years as Chairman of the organization. I’m proud to represent the organization, and humbled to be a part of something so great with such an illustrious history. Over the past few years, I have worked on projects that include digitizing old video footage, streamlining financial operations, and creating organizational documentation. In my day job, I work in marketing for the IT industry, and am involved in the local film community. 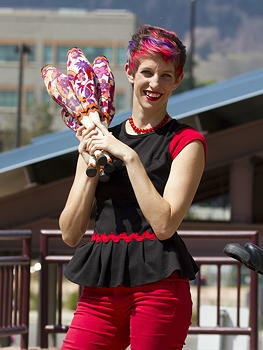 I also help to coordinate various local juggling events and festivals. I would be happy to continue to serve the IJA in any way that I can. For more information on the election, go to: https://www.juggle.org/business/nominations.php. Thanks for participating in the 2016 IJA Board of Directors Election. Effective immediately, the email address for reaching our Membership Director (Marilyn Sullivan) has changed. The new address is: ijamemberships@juggle.org. And remember, you can renew your membership online by logging in to ym.juggle.org and then going to Manage Profile. 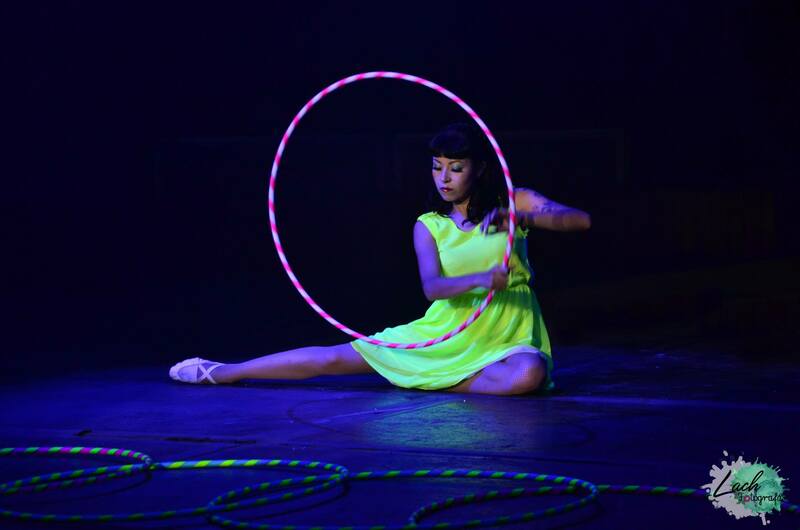 Aleksandra Savina will be teaching a 2-day Special Workshop on hoop manipulation at the IJA fest. The workshop will be held Thursday and Friday from 11am to 1pm, and the workshop fee is $80. Aleksandra is a highly respected international hoop artist from Ukraine. She studied at Kiev State College of Variety and Circus Arts under the tutelage of world renowned juggling instructor, Yuriy Pozdnyakov. 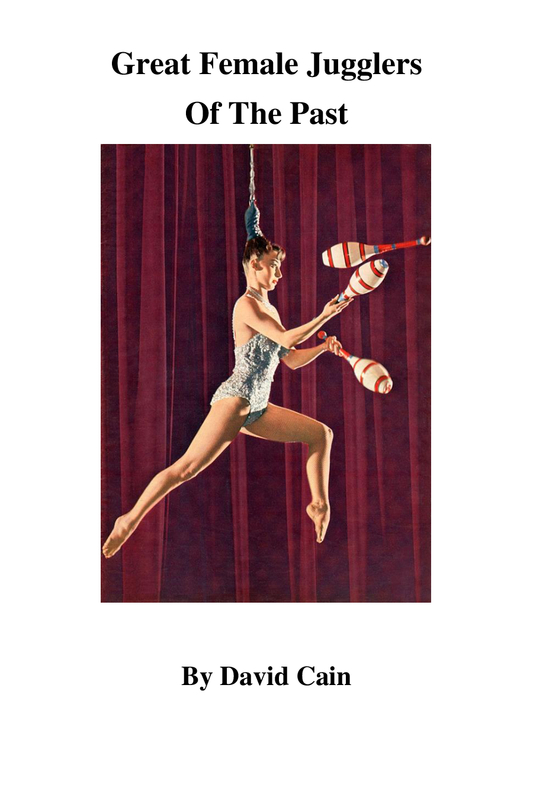 In 2014, she competed in Cirque de Demain and was awarded a Special Prize. Aleksandra’s Special Workshop will encompass 4 hours over a 2 day period. It is open to beginner through advanced level hoop jugglers and artists who want to take their hoop technique and style to the next level. It is recommended that you have three hoops to attend this workshop. Each day will begin with a warm-up and finger exercises, important in building the dexterity for hoop manipulation. 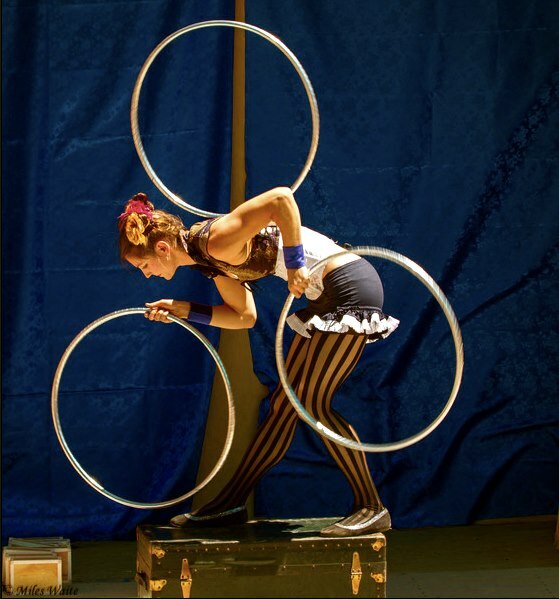 Aleksandra will teach technical tips on a variety of throws, contact hoop juggling on the shoulders and back, and rolling hoops on the floor. These techniques will be applicable all the way from one-hoop manipulation for the novice to more difficult multi-hoop patterns. During the workshop, Aleksandra will also lead a session on group interaction with hoops. This is an excellent opportunity to get hands-on training and style tips from one of the world’s top hoop artists. Sign up now, or at the festival, to take advantage of this unique opportunity to have four personalized hours of training with Aleksandra Savina. The IJA is seeking a couple of dedicated volunteers to be the Festival Registrars for the historic 70th Annual IJA Festival in Cedar Rapids, Iowa, set for July 10-16, 2017. Volunteers can earn a full Festival Event Package for their efforts and be part of the core team that makes the festival so much fun for hundreds of jugglers from around the world. After reading the description of the role below, if you think you might be interested, please contact 2016 Festival Registrar Mike Sullivan at registrar@juggle.org soon so that you can possibly get some hands-on training with Mike this year, both before and at the 2016 festival. He’ll be happy to answer any questions you have. The effort for next year begins early in 2017 with the setup and testing of the online event registration system. Work with the festival team to get festival registrations ready around February or March, and then provide weekly registration reports until online registration ends in June. Once set up, the system is run by automation through the end of online registration, requiring no administrative effort except weekly reports and a few customer service requests. – Coordinating with event directors on event registrations for joggling, numbers, etc. Registration setup and testing requires about 30 hours of work spread across a couple of weeks in January and February. Once registration opens, 2-4 hours/week should be all that’s needed to monitor and report on registrations as well as handle the few customer service issues that come up. It’s a lot of work but very rewarding, and you’ll be part of the core team that makes the 70th annual IJA Festival an unforgettable week of fun in a beautiful, small Midwestern gem of a city. 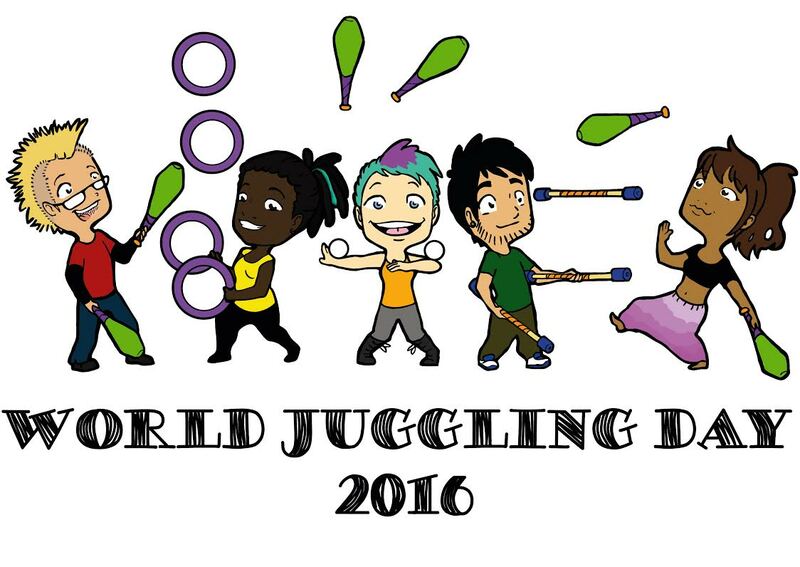 If you’re interested, please email 2016 Festival Registrar Mike Sullivan at registrar@juggle.org. Hands-on training is available starting now and continues with on-site training at this year’s fest in El Paso. 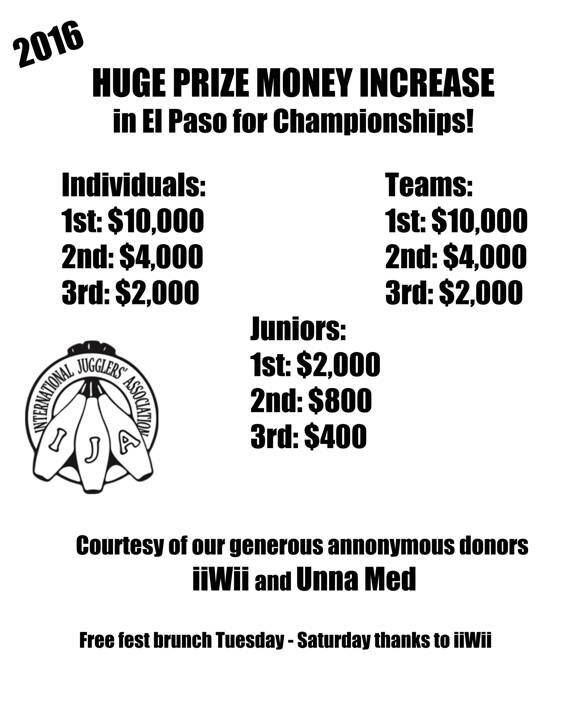 Thanks to our anonymous donor iiWii, all registered jugglers at the El Paso festival will get a free brunch daily. Event Package holders will be entitled to brunch on Tuesday through Saturday. Gym Pass holders will be eligible for free brunch on the days for which they have purchased a Gym Pass. See the details below, and note the different locations and hours for Tue-Wed-Thu versus Fri-Sat. Menu: sliced seasonal fresh fruits, berries, and melons; scrambled eggs; crisp bacon and sausage links; hash brown potatoes; biscuits and gravy; butter pecan pancakes with maple syrup; choice juices, regular & decaf coffee, assorted hot tea. Menu: scrambled eggs with chorizo, rajas de chile verde and ranchero salsa; molletes; guisado de res con papas; red & green chilaquiles; pico de gallo; flour tortillas; Mexican breakfast pastries, butter and preserves; choice juices, regular & decaf coffee, assorted hot tea. Menu: sliced seasonal fruits; pancakes with melted butter and maple syrup; cheese blintzes with seasonal berries; powdered sugar; baked ham; variety of fruit yogurts; freshly baked breakfast pastries, butter and preserves; choice juices, regular & decaf coffee, assorted hot tea. Menu: muffins and bagels with cream cheese, honey, butter and preserves; sliced seasonal fresh fruit; scrambled eggs, green chicken enchiladas with sour cream, cilantro and shredded Monterey Jack cheese; bacon, chorizo & potatoes; re-fried beans; orange juice, Starbucks coffee, assorted hot tea. Menu: scrambled eggs; dollar pancakes with butter & syrup; hash brown potatoes; bacon & sausage links; homemade granola parfaits; red chilaquiles with sour cream, cilantro and shredded Monterey Jack cheese; orange juice, Starbucks coffee, assorted hot tea. Emil Dahl, who will be performing his world-touring act Magnet Opus in the Cascade of Stars, is offering a 2-day, 4-hour Special Workshop at the festival 1-3pm on Wednesday and Thursday. 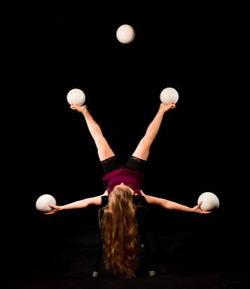 This workshop will have two primary focuses: training techniques and processes for technical juggling, and the development and creation of juggling sequences. You can find out more about the workshop and sign up to be part of it at: https://ym.juggle.org/store/ViewProduct.aspx?ID=6088056. 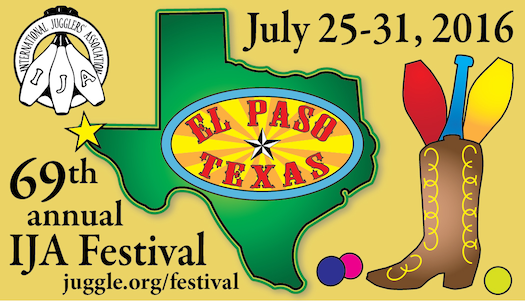 If you’re planning to enter the joggling competition at the El Paso fest, sign up online by June 30 to save a few dollars and speed up things at the festival. Sign up now for $20 or at the fest for $25. The one fee covers you for as many joggling events as you want to enter at the fest. If you would like to offer a workshop at the festival, please give us details using the web form at http://ija.juggler.org/. 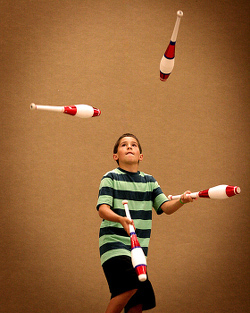 The Youth Showcase is a great opportunity for younger jugglers to perform at the Festival. The Youth Showcase is a non-competitive event at which performers with routines can get stage time to show their skills for a supportive audience. Performers are 18 years old and younger, and routines can be solo or group and should be under 5 minutes. A technical rehearsal will be held on the day of the show, with the performance taking place in the evening. 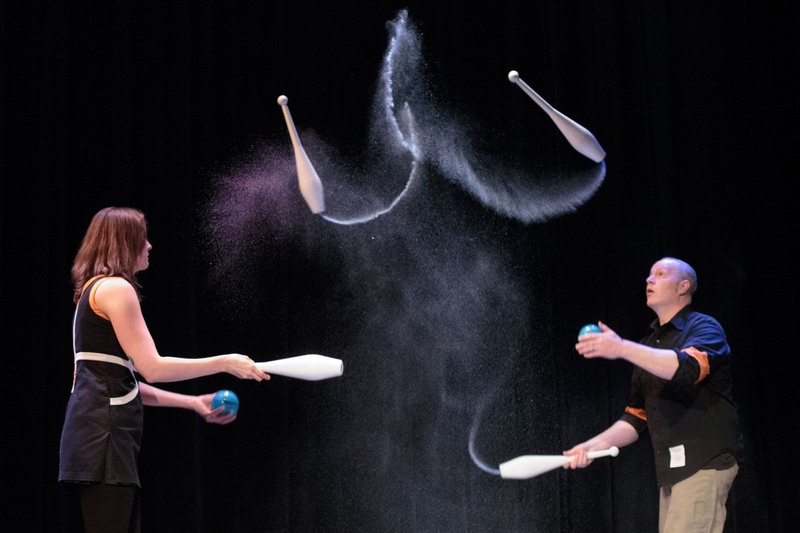 Jugglers who want to perform (or their parents) can contact the show producer, Art Thomas, at youthshowcase2016@juggle.org. 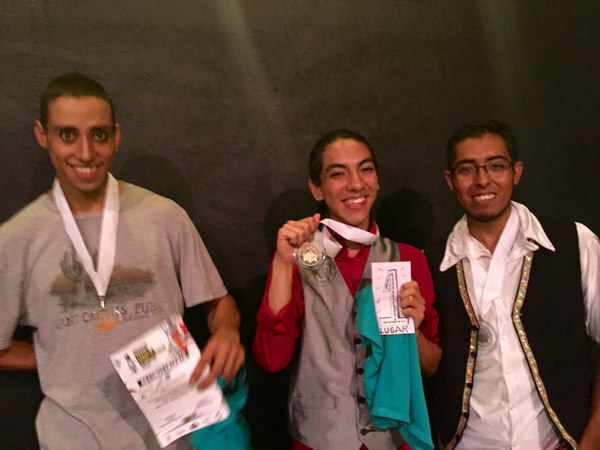 Below are finalists for the Stage Championships at this year’s IJA Festival in El Paso. The Individuals will be competing for a $10,000 first prize, as will the Teams, with a total of over $35,000 in prize money available to the stage medalists. In July of last year, Josh Horton quit his full-time social media job to focus 100 percent on his juggling career. Since then, Josh has appeared on The Ellen DeGeneres Show, ESPN’s Top 10 Plays, Nickelodeon, a national Acura commercial, and over 30 NBA and college basketball halftime shows. Using his social media skill, Josh has grown a following of nearly 250,000 fans. 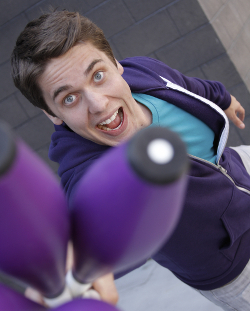 He shares the joy of juggling with them on a daily basis, inspiring many to try juggling for the first time. 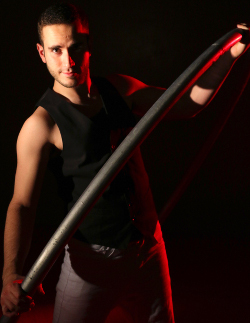 Josh’s act combines his technical skill with his love for music and the stage. 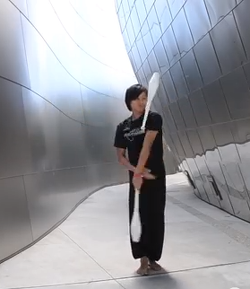 Hiroki Kamei has been practicing diabolo for 15 years. Please enjoy his new diabolo tricks. 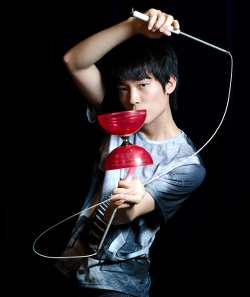 He won first place in the men’s individuals category at the 2013 Tokyo International Diabolo Competition, first place for one-diabolo vertex at the 2014 All Japan Diabolo Competition, first place for one bearing diabolo at the 2015 Diabolo Asia Cup 2015, and first place for men’s individuals at the 2015 Diabolo Malaysia Open Competition. In the mere seven years that he’s been juggling, Sam Malcolm has achieved more than many jugglers do in a lifetime, from winning numbers gold and competing in the Butterfly Man Busker’s Competition, to performing internationally for giant crowds with his one-man comedy variety show in the Edmonton Fringe Festival. Sam loves performing and making people smile. 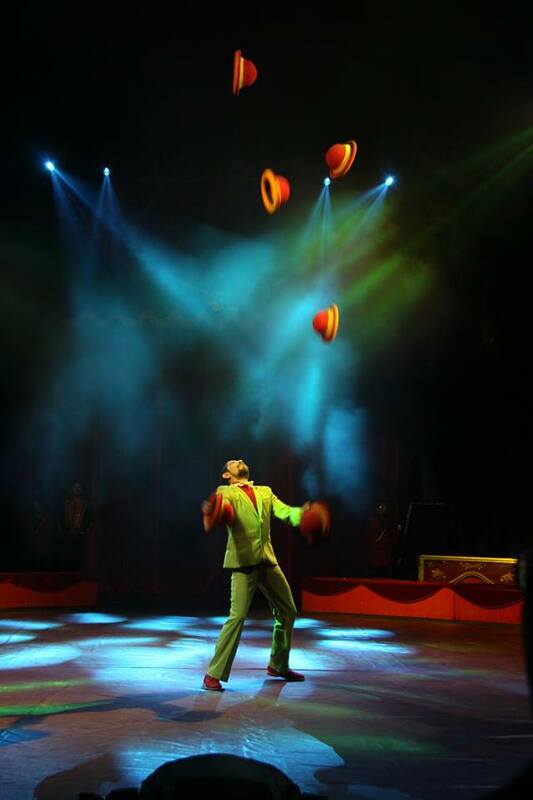 His act was inspired by the time he spent in a touring circus and has its roots in traditional juggling routines of the past. Geoff Marsh also known as Gypsy Geoff has experience entertaining and traveling all over North America with his unique circus stunts and zany marionette puppets. He has been performing at family festivals, corporate events, Renaissance fairs, and private parties for over 12 years, performing his 30-45 minute show over 400 times a year. Two years ago he won first place in the International Jugglers Association’s street performing competition. He avidly donates his time performing and teaching workshops with Clowns Without Borders in refugee camps and rural areas of social and economic crisis all over the world. 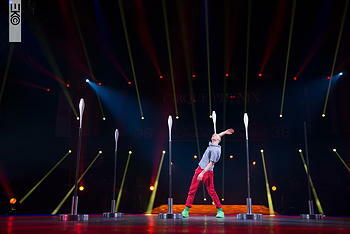 Jorden Moir (MOY-er) is a 28-year-old professional juggler from Ontario, Canada. 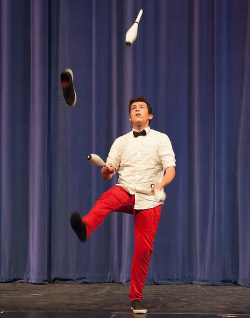 He has been juggling for 15 years and juggles a wide variety of props, with a specialization in foot juggling with beanbags. His performing venues include dinner theaters, corporate events, and European variety shows. Jorden was the 2010 IJA Individual Stage Champion. Aki and Takeru consists of Aki Ueno and Takeru Hirano, the two devilstickers who have been trying their best at devilstick juggling for a long time. They have conceived a lot of new devilstick tricks that you have never seen and improved their technique up to this day. Their consummated devilstick juggling and combinations will make you all surprised. Balance-in-Motion consists of Heather Marriott and Neil Jordaan. 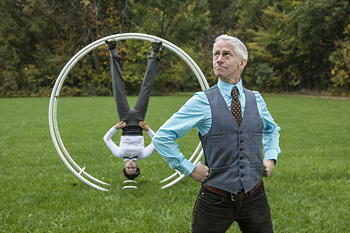 Both have had a life-long love of circus arts, and incorporate these influences to take their juggling to new heights. When they met at the 2008 IJA Festival, they never imagined that eight years later they would find themselves in the IJA Teams competition. 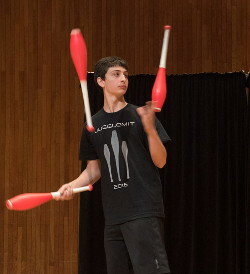 Jonglissimo: Daniel Ledel and Dominik Harant were inspired to practice juggling through a workshop at their local school. One of the juggling teachers was Manuel Mitasch. Now they perform together all over Europe. They won IJA gold medals in 2005, 2007, and 2013 and have over 15 world records. 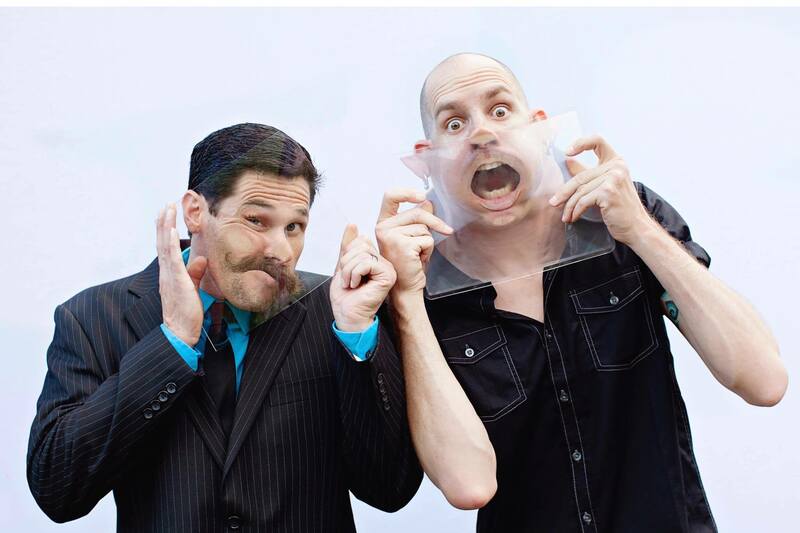 Normally, their shows are a unique mix of theater, juggling, and multimedia arts. 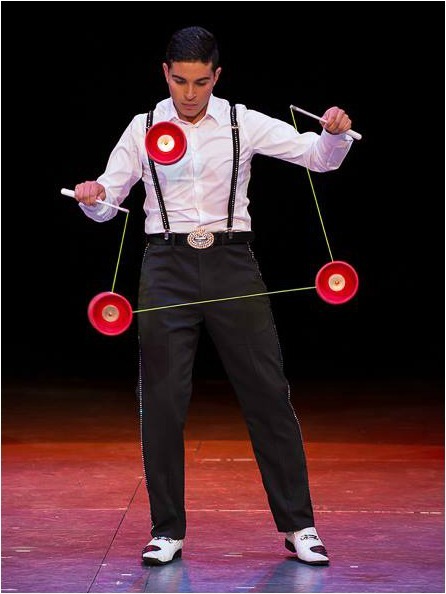 At the IJA stage championships they will focus on the raw art of juggling by pushing their technical ability to the next level. 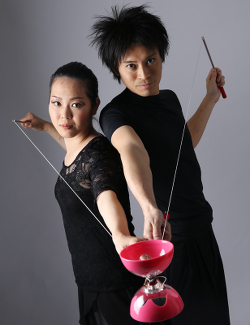 Diabolo performance duo Totchees is from Nagoya Japan and consists of Tetsuya Tochikubo and Ayaka Tochikubo. 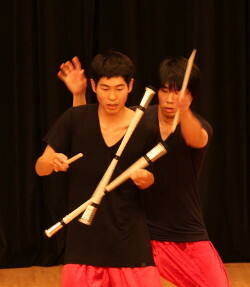 In 2015, Totchees won the All-Japan Diabolo Competition for teams. They have won various other prizes and championships and have performed at a lot of festivals. 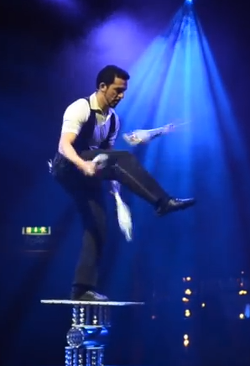 Most of the act is composed of original pair tricks. Totchees especially hopes you enjoy the vertical diabolo tricks. It is their dream to perform on the IJA Championships stage. 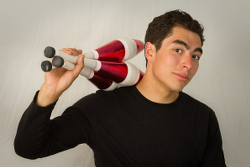 Jonah Botvinick-Greenhouse has been juggling for six years, since he was ten, and has participated in several competitions held by the World Juggling Federation. In 2013 and 2015, he won the WJF’s advanced overall championship. 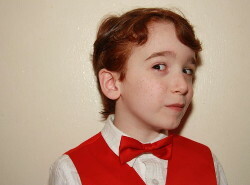 Jonah has attended the past three IJA festivals, but this is his first time competing. 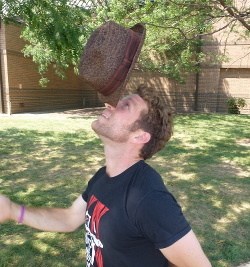 In addition to juggling, Jonah also enjoys playing cello and ultimate Frisbee. Christopher Haaser is 15 years of age. 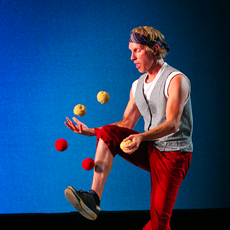 He began juggling in 2009. 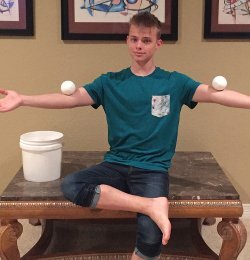 He has amazed audiences with his juggling skills in Utah, Nevada, Colorado, Texas, Minnesota, North Carolina, Ohio, Indiana, and Quebec. 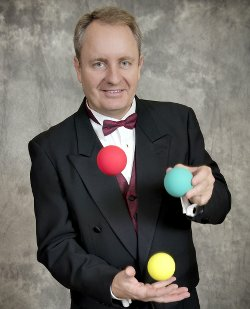 At the age of 10, Christopher juggled seven balls and performed for Spooky Woods, a TV commercial filmed in North Carolina. He was an eight-time podium finisher at the 2014 IJA joggling competition. 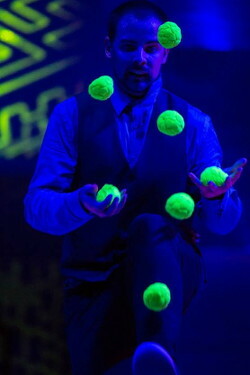 He currently juggles balls, rings, clubs, fire torches, knives, and much more. Other interests include chess, kendama, dominoes, kinetic contraptions, trampoline, skiing, swimming, kayaking, and more. Bennett Santora was created by a group of mad scientists who were intent on taking over the world by installing jugglers in key leadership positions. He was designed to be witty, intelligent, and charming and to have supernatural juggling ability. He is being groomed to take over the world military industrial complex and convert all weapons production to production of juggling props. At present, he is an entertainer and sixth grader. He lives in New York City. Daniel Van Hoomissen be Insane in the Membrane, and he lives in Funky Cold (M)Edina, which is a Gangster’s Paradise. Like Tag Team, Daniel is back again. He is Berzerk, and loves to Jump because he is Space Bound and Not Afraid. He is So Fresh that you Can’t Touch This. He is super Boombastic. There are a few things that you should do to improve your festival experience. There are lots of jugglers and a somewhat limited supply of prop makers. Even though you have selected the decorations on your props with care, there are probably other props in the gym that look remarkably like yours. Identify your stuff before you get to the gym. And bring a marker or something so that you can put your name on things that you buy at the festival. I tape a label with my name on each of my clubs. It makes it easier to pick mine out of a pile with confidence. Don’t put your stuff in the middle of the juggling space and expect to find it exactly where you left it. 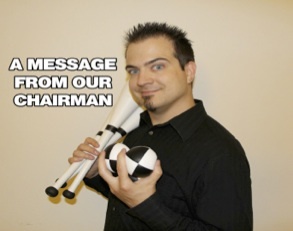 Balls roll around, and clubs get tripped over and kicked out of the way. If you are not actually juggling, put your stuff off to the side, or in a designated area to keep it, and other jugglers, safe. You are going to be on your feet a lot. Those of us who sit at a desk most of the time are not really used to a full week of standing. Hard concrete floors are great for ball bouncing, not so great for your feet. Check out your shoes to see what shape they are in. Broken down favorites with footbeds squashed into submission are rapidly going to lead to sore feet and poor sleep. You can’t count on finding a good shoe store with exactly the size you need at the price you want to pay when you are away from home. If you need new shoes, get them now and break them in a bit before the festival. There are a lot of different styles of replacement footbeds on the market that can extend the life and comfort of your favorite shoes. Athletic shoes with good support are a probably the best thing. They are often made for use on hard surfaces. Another option is industrial shoes. These are made to be comfortable on a shop floor and generally have a good tread. Some of them are made to resemble running shoes. There are even shoes that are made with springs in the heels to put a bit of extra bounce in your step. Things get moved around at a festival. If you dropped your hoodie on a chair or something once you got warmed up, it might get moved during the day if the juggling space gets re-configured. Put your name on things that are not attached to you. It makes it a lot easier to manage lost and found items if they are identified. You might be surprised at the number of cell phones, wallets, and glasses that turn up missing their owners during the week. If there isn’t any identification, how are we supposed to know who to give things back to? How are you going to prove it is yours? If your phone lets you put your name on the home screen, that helps a lot; if your phone gets turned in, we can page you on the PA in the gym. Be prepared, and have a great festival. 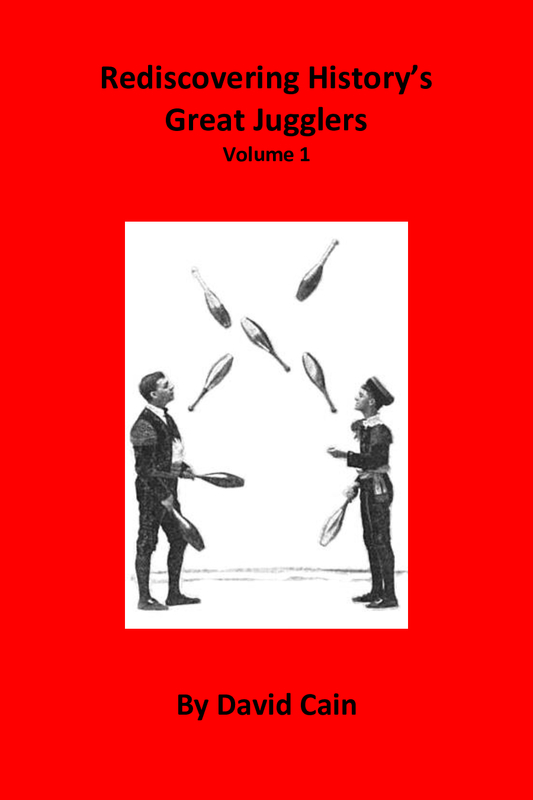 Three juggling history books by juggling historian and author David Cain have been published recently and are available for sale. In the United States, you can purchase them from the publisher by clicking here. To purchase from outside the United States, contact David at davidcainjuggler@hotmail.com for more information. David will also have the books at the IJA Festival and will be offering a discounted price if you purchase all three books from him there. 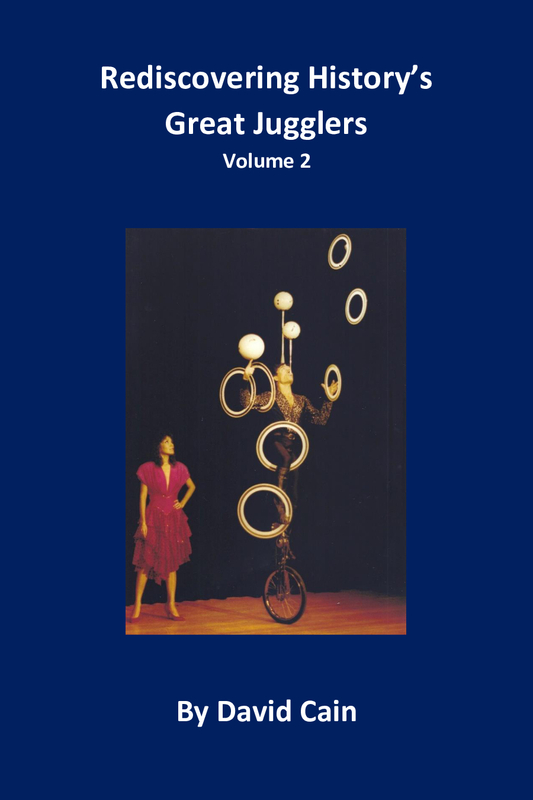 The books are Great Female Jugglers Of The Past, Rediscovering History’s Great Jugglers (Volume 1), and Rediscovering History’s Great Jugglers (Volume 2). David plans on writing three more books by next year’s IJA Festival. 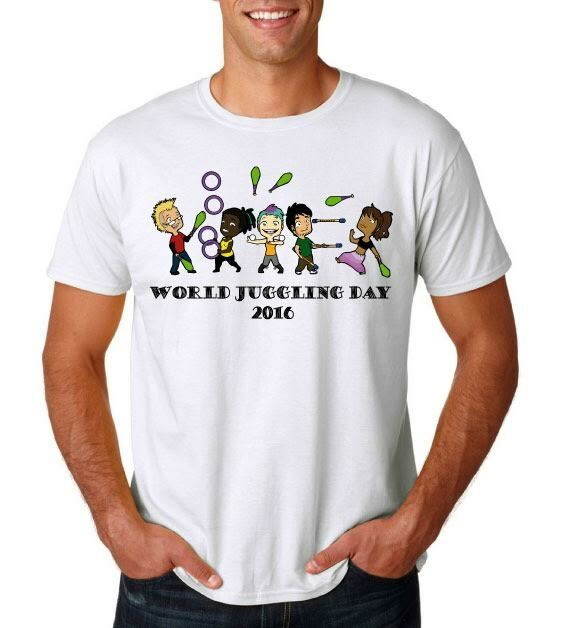 You can still get a 2016 WJD T-shirt to show your pride in being a juggler, but order soon because no orders will be accepted after July 1. 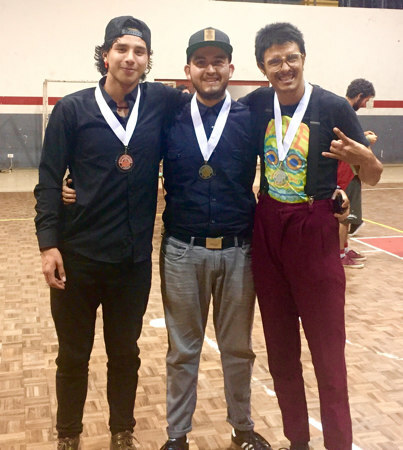 The 2nd Annual IJA Regional Competition, Central America, took place on World Juggling Day, June 18, in San Jose, Costa Rica. The skill level of the competition had risen quite impressively in comparison to last year. One of the goals of the IRCs is to inspire progress in the region where the competition is held, and it is obvious that this happened over the past year in Costa Rica! You can watch the highlights from the gold medal act by Richi Fallas. 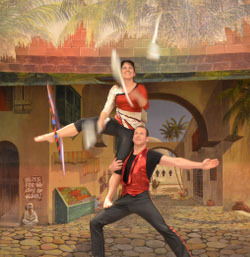 The 5th IRC Mexico took place June 22 at the Periplo International Circus Festival in Guadalajara. The skill level was the highest it’s ever been, and we even tried our hand at the first live coverage video of the competition on the IJA Facebook page. The live feed reached over 80,000 people. We have DVDs for sale from the IJA fests in: 2007, 2008, 2009, 2011, 2012 and 2013. Each year includes two DVDs and roughly two hours of video. 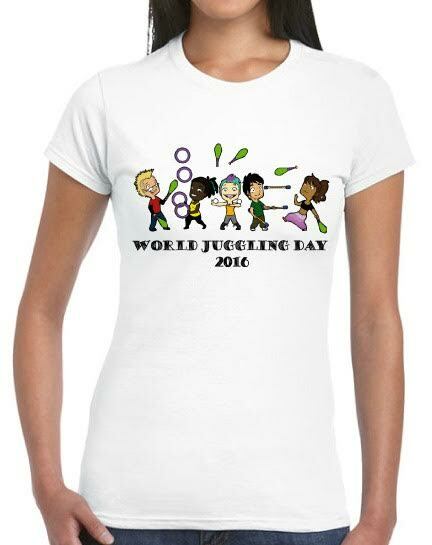 For a list of even more festivals, check the worldwide juggling event listings on our website at: www.juggle.org/events. 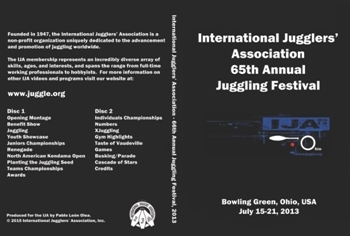 If you’re organizing a juggling festival (or if you simply know of a juggling fest) and you want to advertise it in the IJA eNewsletter, just drop a note to eNewsletter editor Don Lewis ijanews@juggle.org. Such listings are free. The eNewsletter comes out near the end of each month. Your festival can be listed for a few months, and you don’t have to be an IJA affiliate to have a fest listed. 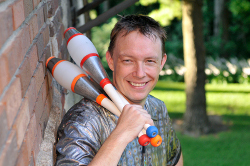 Hey, jugglers want to know about juggling fests. Help them out and get more jugglers to your fest at the same time.